Staring at computer monitors, smartphones, and video game screens may result in strained, dry, and tired eyes. Luckily, using these devices does not seem to have permanent effects. 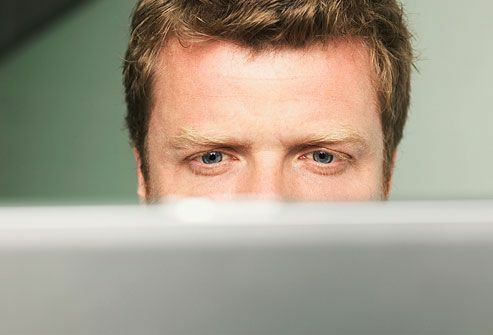 To prevent eye strain, adjust your computer monitor so that it's 2 feet in front of you. Use desk lighting to reduce glare. Take a break every hour. Spend a few minutes looking at something much farther away than the monitor. Healthy adults younger than 40 usually have stable vision. To maintain your vision and overall eye health, wear sunglasses that have UV protection. 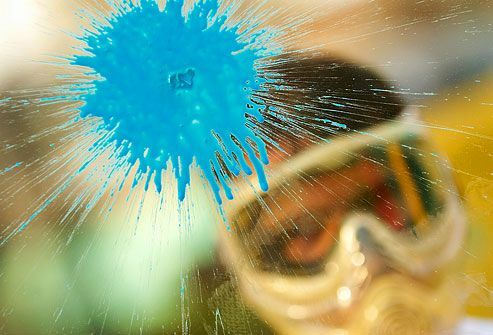 Wear protective gear when playing sports or working with power tools, machinery, or chemicals -- both at work and at home. Oh, No! It's Time for "Readers"
The need for reading glasses happens to almost everyone. By the time you reach your mid-40s, it may be tough to read and perform other close-up tasks. This vision change is called presbyopia, and it's normal. You can wear reading glasses, bifocals, or multifocal contact lenses to correct your vision. Sometimes laser surgery can help, too. Before the age of 40, the natural lens of the eye is very flexible. This helps the lens focus on objects that are close up or far away. But as we get older, the lens tends to lose its flexibility. Gradually this lowers the ability to see up-close objects, especially in low light. If you have presbyopia, you might have to hold an object like a book or a menu farther away to see it clearly. Some diseases, like diabetes and high blood pressure, can affect vision and eye health. Diabetes is a leading cause of blindness in adults. 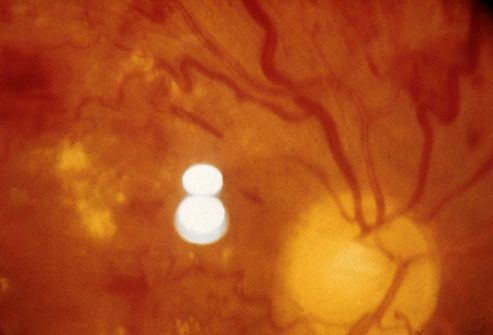 People with diabetes may develop retinopathy (shown, damage to blood vessels in the retina). High blood pressure can damage the eye's blood vessels and nerves. It can cause permanent vision loss. When you take care of your overall health by eating well and not smoking, your eyes (and the rest of your body) benefit. Cataracts (shown) and glaucoma can happen at any age, but they most often happen in people over 60. 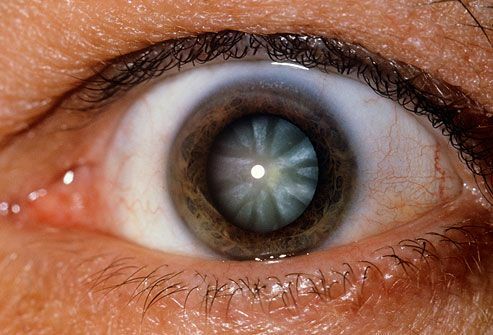 A cataract is a clouding of the eye's lens. It can easily be removed and replaced by a special lens during surgery. Glaucoma is a deterioration of the eye's nerve over time. It is often accompanied by increased pressure in the eye. Glaucoma is treated with eyedrops or surgery to decrease eye pressure. Age-related macular degeneration (AMD) is more common in people over 60. It can cause a partial loss of vision. "Wet" AMD happens when new, unwanted, leaky blood vessels grow in the eye. It can be treated with medicine. "Dry" AMD is a slower process and does not have a specific treatment. But certain doses of vitamin and minerals may slow or stop it. Ask your doctor about that. Vision rehabilitation may help you adjust to life with AMD. A healthy diet can help maintain your eye health. And some foods may be especially good for eyes, too. Lutein, omega-3 fatty acids, and vitamins C and E may promote eye health. So eat citrus fruits like oranges and tangerines, green, leafy vegetables, nuts, and fatty fish. 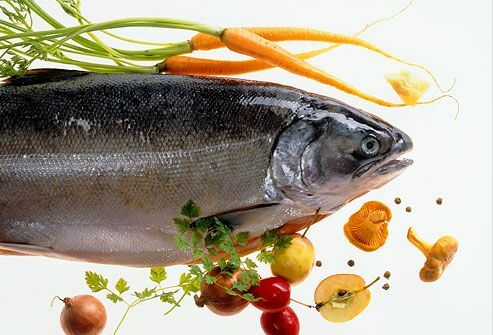 Eating fish and green, leafy vegetables may prevent age-related macular degeneration, too. (4) BSIP / Photo Researchers, Inc.
American Academy of Ophthalmology: "Normal Vision Development in Adults Under 40," "What is Glaucoma?," "What are Cataracts?," "What is Age-Related Macular Degeneration?," "Normal Vision Development in Adults," "Cataract Surgery," "IOL Implants: Lens Replacement and Cataract Surgery," "Glaucoma Treatment," "Sunglasses: Protection from UV Eye Damage," "Computer Use and Eyestrain," "Preventing Eye Injuries." American Optometric Association: "Color Vision Deficiency," "Adult Vision: 41-60 Years of Age." National Eye Institute: "Facts About Age-Related Macular Degeneration," "Facts about Diabetic Retinopathy," "Facts About Cataract." National Diabetes Information Clearinghouse (NDIC): "Fast Facts." National Institute of Diabetes and Digestive and Kidney Diseases (NIDDK): "Vision Disorders in Diabetes." Glaucoma Research Foundation: "Glaucoma Facts and Stats." University of Maryland Medical Center: "Glaucoma: Risk Factors." 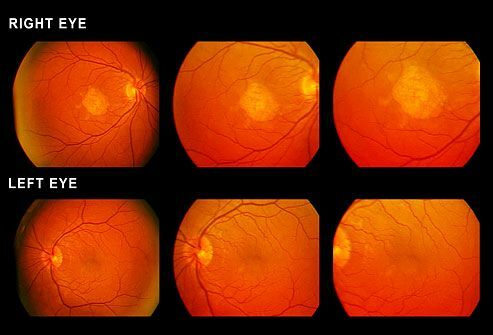 Macular Degeneration Partnership: "What Is AMD?"